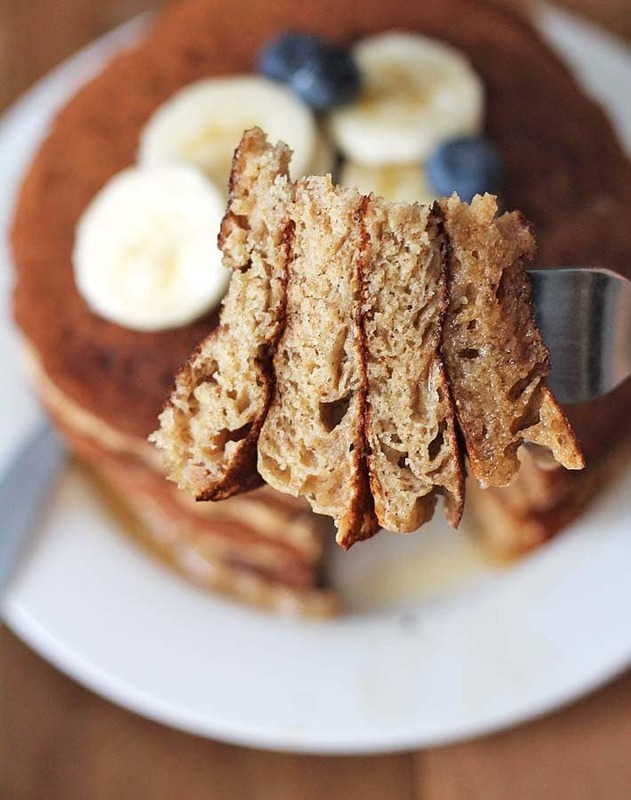 Easy-to-make, ultimate fluffy vegan banana pancakes that will become a new family-favourite breakfast. They can also be made gluten-free, details are below! 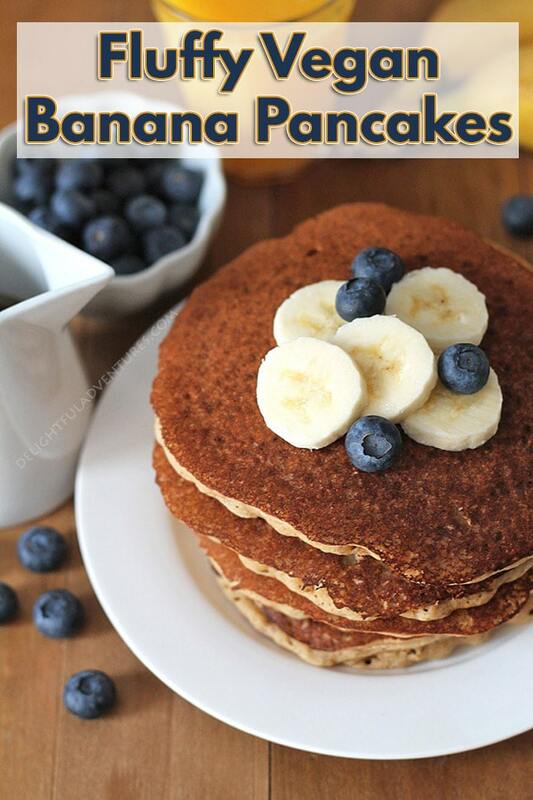 Banana pancakes with no egg, no flour, and no milk? Yes! It’s true! (For the no flour part, I’m talking about the gluten-free version that uses a gluten-free flour blend details below!). It’s absolutely not necessary to include those ingredients in your pancakes to get a good result. This recipe is proof of that. In fact, this recipe is good enough to fool anyone into thinking they’re eating non-vegan, gluten-filled pancakes. The only difference between each version is the amount of non-dairy milk and flour being used, everything else remains the same. I tested each recipe quite a few times to be sure the measurements were all perfect, and they are! Luckily, my family members are very willing participants in my recipe testing and had no problems eating gluten-free banana pancakes several times in a short span. Top your pancakes any way you like, I prefer them as shown in the pictures, with banana slices, fresh blueberries, and pure maple syrup. Some more ideas for you: coconut whip, strawberries, raspberries, maple caramel sauce, pecans, walnuts, or even a spoonful of mini chocolate chips. Speaking of mini chocolate chips, these pancakes turn into an even more fun treat when you add a handful of mini chips to the batter, or for some texture, you can add a handful of chopped walnuts. OR…to make them vegan banana blueberry pancakes, throw some frozen wild blueberries into the batter. You can also just have them as-is if that’s what you prefer, they’ll be delicious any way! YES. They are! Many recipes out there promise fluffy pancakes but when you make them, they end up being flat, and/or gummy, and are just…meh. That’s not the case with these pancakes. 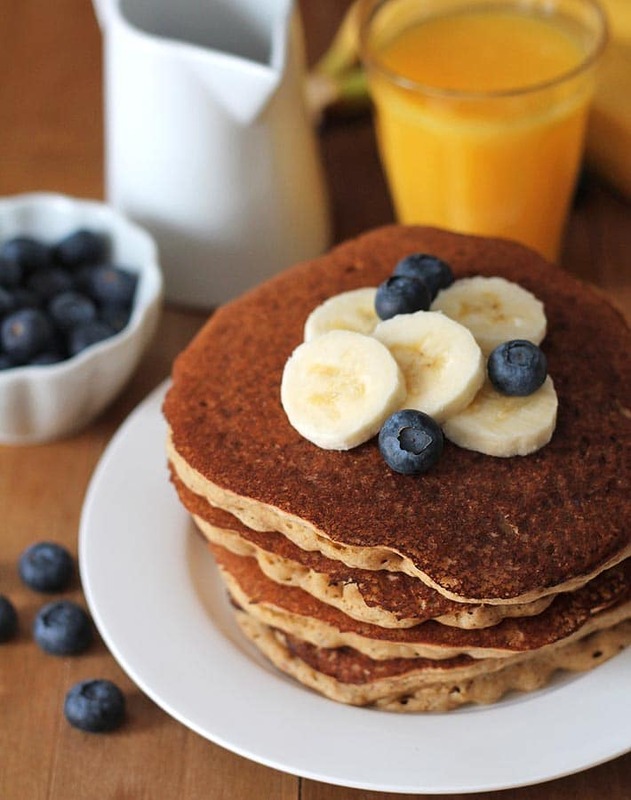 The photo below is of the vegan gluten free banana pancakes and the vegan versions are just as fluffy. 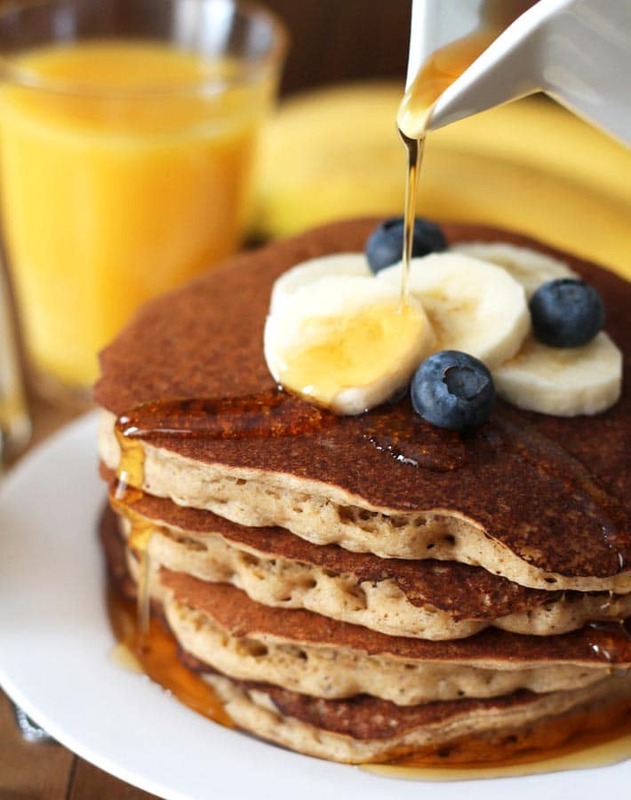 No matter which version you choose to make, as long as you follow the recipe exactly as written, you’ll end up with fluffy banana pancakes that have a hint of spice from the cinnamon and nutmeg. Yum! And if you make them, share a pic with me on Instagram! I’m @delightfuladventures over there and my hashtag is #delightfuladventures. I look forward to seeing your remake! 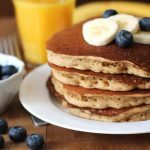 Easy-to-make, ultimate fluffy vegan banana pancakes that will become a new favourite family breakfast or brunch item. Instructions on how to make them gluten-free are also included! 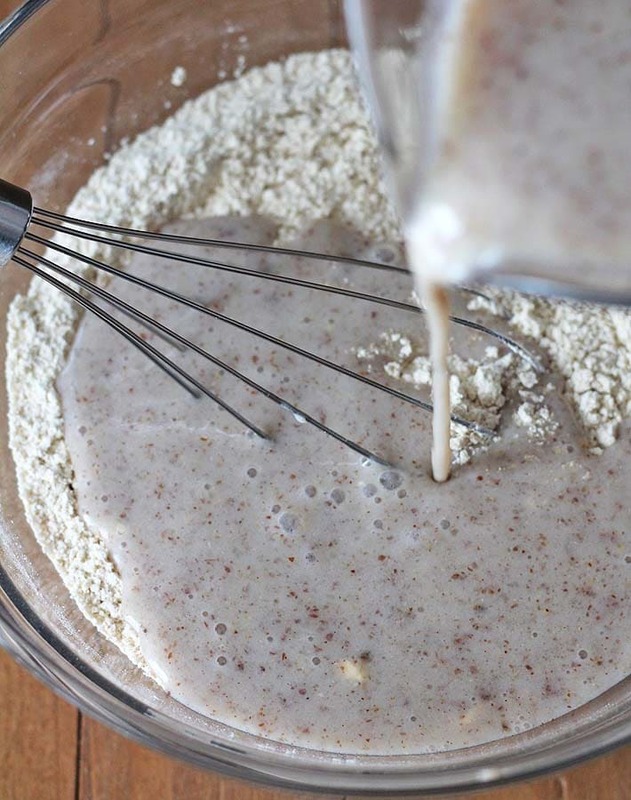 Whisk non-dairy milk, banana puree, coconut oil, vanilla extract, and ground flax seeds together in a medium-sized bowl, whisking enough to incorporate the flax seeds. Let sit for 5-minutes. Whisk flour, baking powder, baking soda, ground cinnamon, ground nutmeg, and salt together in a large bowl. It's important to know that all gluten-free flour blends use different ingredients and ratios, so results will always vary when you use different brands. I have never used any other brand of flour to make these pancakes (other than Bob's Red Mill), so please know that your results may not be the same as mine if you substitute with a different flour. Coconut flour will NOT work in this recipe. Be sure that the bananas you use are very ripe and browning. I puree the bananas until they are smooth and have no chunks. If you prefer to have some banana pieces, puree to the texture you like but you may have to add more milk to thin the batter out a little. Optional maple syrup is for if you prefer a sweeter pancakes. Nutrition info listed below is for 1 of 8 vegan banana pancakes, without the optional maple syrup, no toppings, and using unsweetened almond milk. Nutrition info is to only be used as a rough guide. 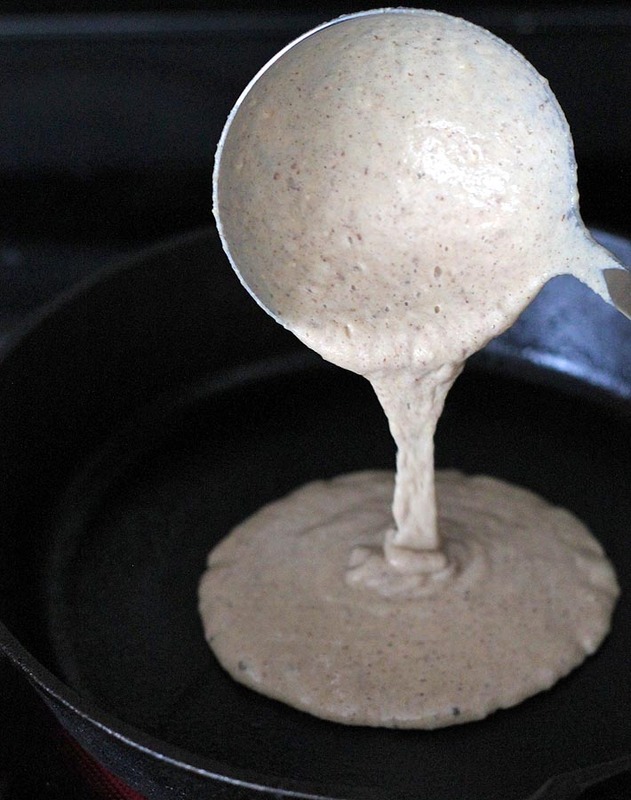 Calorie count for 1 vegan gluten-free pancake is 173 calories. Click here for more info on how nutrition info on this website is determined. Do you know if the recipe would still be good without the baking soda? These are delicious!! My kids loved them. I added blueberries for an extra “something” and they turned out amazing. Thank you!